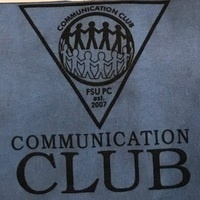 The Communication Club's motto is "Communication in Action!" The social club frequently holds events for students to network with each other, help the community and gain professional development. The club also hosts the annual luau-themed Pineapple Powwow during Spring Fling. Any major is invited to join, and communication majors with a cumulative 3.0 GPA or higher will be able to wear a Communication Club honor cord during graduation.